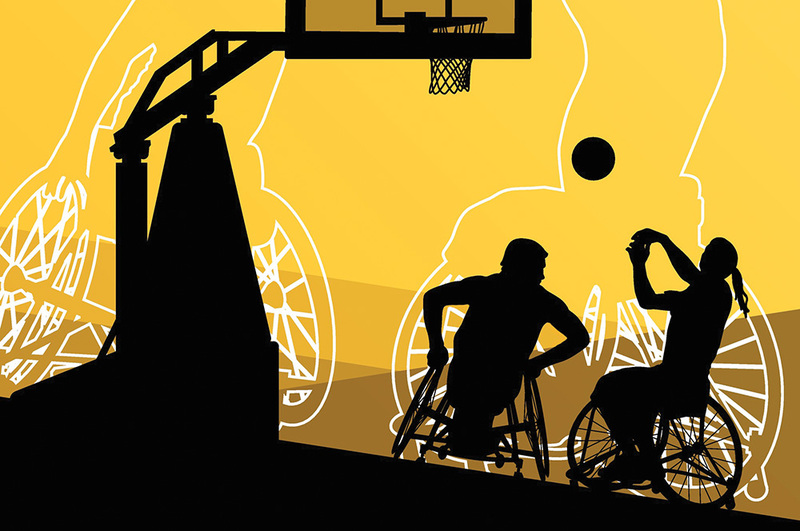 The Larry Turner Classic is a National Wheelchair Basketball Association (NWBA)-sanctioned tournament hosted annually by the Texas State University Recreation Division and the Seton Brain and Spine Institute. The tournament, which has become a fixture on the early-season schedule for Texas’ adaptive-sports community, will see its ninth iteration in October 2016. Each year, teams from across the state come to the Texas State University campus in San Marcos to compete in Championship, Division III, and Juniors Divisions. The level of competition, particularly in the Championship Division, is exceptionally high. Three tournament regulars are currently ranked among the division’s top 20 teams nationally, and the top-ranked Dallas Wheelchair Mavericks—that won the Classic in 2015—vied for a 14th NWBA National Championship in April. Despite the big-time rivalries being contested on the courts, though, the atmosphere in the gym is one of cooperative learning and mutual support. The Classic, after all, is as much an educational experience as it is a basketball tournament. It is executed by a team of over 100 student volunteers, many of whom are being exposed to adaptive sports for the first time, under the guidance of their faculty and community partners. Under the guidance of the competing athletes, too, who embrace the tournament as a showcase, not only for elite talent but also for the power of the sport they love. This advocating spirit—as well as the uniquely student-centered production strategy—makes the Larry Turner Classic a particularly convincing case for both the need for adaptive-sports programs and the feasibility of providing them. Higher levels of enjoyment and empowerment (Martin, 2006; Martin, 1999). Physical improvements, such as lessening of secondary conditions and development of wheelchair skills, are also direct benefits (Van der Ploeg, 2004; Greenwood, 1990; Campbell, 1994). 22 completed the survey, representing a 37-percent return rate. The mean age of the respondents was 31, with a range from 18 to 55. The majority of respondents (54.5 percent) identified as Hispanic or Latino, while 22.75 percent identified as white and black, respectively. There were more male respondents (91 percent) than female (9 percent). Some 18 percent of respondents identified as being current or former military members. The mean length of participation in adaptive sports was 9 years and 3 months. Respondents indicated a variety of motivations for participating in adaptive sports, but the main reasons were for the competition (73 percent) and participation on a team (50 percent). The results of the survey affirmed the value of adaptive sports—a majority of respondents either agreed or strongly agreed that adaptive-sports participation led to improved overall health (81.8 percent), quality of life (68.2 percent), quality of social life (68.2 percent), and quality of family life (50 percent). Answers to an open-ended, descriptive question supported a belief that participation in adaptive sports has notable benefits, both psychosocial and otherwise. Participants expressed that adaptive sports allowed them not only to “be in shape” but also to “be on an even playing field and … be competitive again [after an injury].” Many athletes recognized their participation in adaptive sports as “a life-changing experience” and noted that, because of the magnitude of that experience, they felt obligated to act as advocates. As parks and recreation professionals, we generally understand that sports participation can have such significant benefits for physical and social development because the nature of sport necessitates a level of consistent engagement that leads to not only an activity-oriented healthy lifestyle but also a social identity built through and around sports. We provide and advocate for both youth and adult sports, not because it is a requirement of parks and recreation agencies but because we truly believe in their value. This value is especially substantial for athletes with physical disabilities and suggests a critical need to make adaptive-sports participation opportunities available as widely as possible. The reason many parks and recreation agencies do not translate this steadfast support for sports into providing adaptive-sports programs is that it doesn’t seem possible. I believe it is. I will be involved with the Larry Turner Classic for 5 years in November—as both an undergraduate and graduate student—and have been consistently surprised at the relative simplicity of making it happen year in and year out. Sure, it involves a lengthy task list and coordination of a mass of resources, but this is a statewide tournament! There are few differences between planning and executing an adaptive-sports program and planning and executing general sports programs. A majority of those differences are facility-related. At the Classic, two gyms in an academic building that was constructed in 1978 are used. Many of your facilities, I’m sure, meet the requirements of the ADA Standards for Accessible Design but were certainly not designed with wheelchair athletes and spectators in mind. While the building is not an ideal location, it works. You can make your existing locations work, too, by making a few, simple, low- or no-budget fixes, such as adding permanent or temporary handicap-accessible parking spaces to account for increased need, removing mullions in double doors to allow the 48-inch width necessary to fit cambered sports chairs through without disassembly, and adjusting the building’s temperature to accommodate athletes with spinal-cord or traumatic-brain injuries who are sensitive to heat. When possible, you can maximize value and minimize cost of upgrades by including them in new construction or renovations—many building and design professionals have integrated principles of true accessibility into their plans for parks and recreation facilities. Other practical considerations are related to the safety and integrity of these programs. Many safety concerns are alleviated when facilities are properly modified, but it is also important to understand the needs of adaptive-sports athletes, as well as the rules and regulations of specific adaptive sports. These can be achieved in partnership with community resources and official organizations. Local rehabilitation hospitals, Veterans Administration facilities, schools, and professionals, such as recreation, occupational, and physical therapists, will be happy to offer advice and connect you with potential participants. Organizations such as the NWBA (www.nwba.org), US Tennis Association (www.usta.com), US Paralympics (www.paralympic.org), and Disabled Sports USA (www.disabledsportsusa.org) provide robust general and sports-specific information related to establishing programs and training coaches and officials. Of course, in establishing any new program, it’s crucial to determine that adaptive-sports programs are appropriate for your agency. Be sure there is enough interest for a fledgling program and that existing resources can be adjusted to support the program as it expands. Also, consider collaboration with the community partners mentioned above—particularly recreation therapists—and seek out students in recreation programs similar to those at Texas State University. Once your program has been established and has found solid support, you’ll be more than capable of providing a quality adaptive-sports program with real value to your constituents. After all, if a group of green students can pull it off, surely an experienced athletics coordinator can! Sarah E. Walters, CPRP, is a Graduate Assistant in the Recreation Division in the Department of Health and Human Performance at Texas State University. Reach her at (512) 966-8505, or swalters@txstate.edu. Dr. Jo An M. Zimmermann, CPRP, has a BS in Recreation and Park Administration from Western Illinois University, an MBA from Olivet Nazarene University and a Ph.D. in Parks, Recreation and Tourism Management from Clemson University. She has taught at both Clemson University and at Victoria University in Melbourne, Australia. Currently she is an Associate Professor at Texas State University. Greenwood, C. M., D. A. Dzewaltowski, and R. French. “Self-efficacy and psychological well-being of wheelchair tennis and wheelchair non-tennis participants.” Adapted Physical Activity Quarterly, 7, 12-21, 1990. Martin, J. J. “Psychosocial aspects of youth disability sport.” Adapted Physical Activity Quarterly, 23(1), 65-77, 2006. Martin, J.J. and C. A. Mushett. “Social support mechanisms among athletes with disabilities.” Adapted Physical Activity Quarterly, 13(1), 74-83, 1996. Shapiro, D. R. and J. J. Martin. “The relationships among sport self-perceptions and social well-being in athletes with physical disabilities.” Disability and Health Journal, 7, 42-48, 2014. Van der Ploeg, H. P., et al. “Physical activity for people with a disability: A conceptual model.” Sports Medicine, 34(10), 639-649, 2004.